Like all kinds of students, many first-year collegiate black men actively seek advice and guidance about navigating the world. They place high value on words of wisdom passed along from black men who have confronted and overcome challenges. Perhaps they're looking for a map of sorts. 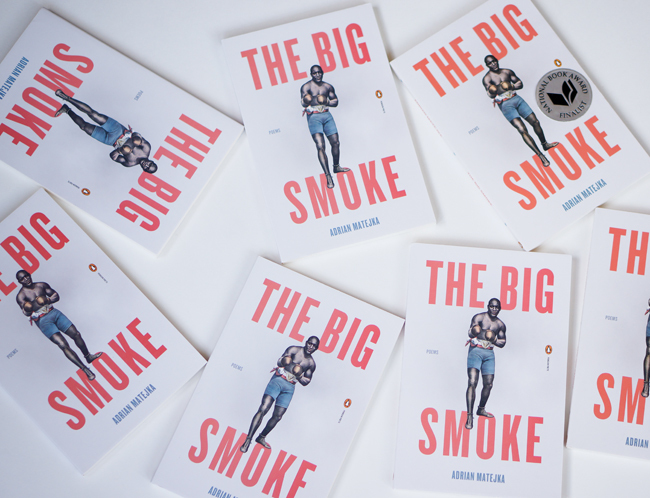 Not surprisingly, the guys who've enrolled in my literature courses for first-year black men students over the last few years have expressed strong, positive responses to Adrian Matejka's Jack Johnson poems in The Big Smoke. The poems in the volume are primarily presented from the first-person perspective of the heavyweight boxing champion, as he's regularly dropping knowledge about what he's seen and done. In "Battle Royale," Matejka's Johnson references the long history of troubling forms of entertainment by citing Shakespeare's discussion of brutal treatment of animals. When bear-baiting became illegal, then "some smart somebody," says Johnson, "figured coloreds would fight just as hard if hungry enough." In "Sporting Life," Johnson favors the pursuit of a carefree, adventurous life -- what contemporary folks refer to as YOLO -- over worrying and "talking about if & suppose." Even when Johnson is expressing arrogance, his "Shadow" critiques and humbles the boxer by reminding him of his many shortcomings and his inevitable losses against the powerful foe, racism. Johnson's early recklessness gives rise, we conclude, to some of his later wisdom. The guys respect the writings of men like Frederick Douglass and W. E. B. Du Bois, but those and other figures do not offer us the kind of conversational tone that Johnson does. So it's about the words and also the presentation. Further, Matejka ensures that we witness Johnson's shortcomings as well as his strengths -- a cultural figure all the more fascinating because of his imperfections. Finally, there's the important matter that when we read those poems privately and out loud together in class, we get the sense that Matejka and Johnson are talking directly to us, a group of black men.